(ISJM) Descendants of the Jews of Radautz in Bukovina, (now Radauti, Romania) have banded together to work with the local Jewish Community and the Federation of Jewish Communities of Romania to document the town's Jewish heritage –including all of the gravestones in the cemetery - and to make this information available on-line. Since 2005, the group has amassed thousands of photos of the cemetery gravestones and epitaphs, and these have now been listed in an online database. Last year there were tensions between the "outsiders" and the local Jewish community which produced a flurry of accusations that spilled into the local media. Now, however, misunderstandings seem to be resolved, and both groups are united in their commitment to maintain the historic cemetery and to develop a restoration program for the synagogue, which is, overall, still in good condition. Click here for an online slideshow of the synagogue showing where repairs are needed. It was built in 1879. The synagogue, which is listed as a protected historic site, has recently been included in the "Action Plan for the Protection of the Jewish Heritage" adopted by the Romanian Government. A good portion of the costs for restoration, for which planning began in 2007, will be covered from this source. Additional funding for the project will certainly be needed. In October 2008, the Center for Urban History of East Central Europe will hold an international conference dedicated to Urban Jewish Heritage and History in East Central Europe. The conference will coincide with the opening in Lviv of the exhibit Wo ist Lemberg? that originated in Berlin. The conference is the first such gathering in Lviv and one of the first in Ukraine, and will address the physical and cultural legacies of the Jewish civilization destroyed by the Holocaust have long been neglected in Eastern and Central Europe. One goal of the conference is to bring the experiences of other Jewish heritage centers to Ukraine, where planning, preservation and education have lagged since 1989. My sister, Ruth Ellen Gruber, author of Virtually Jewish: Reinventing Jewish Culture in Europe (2001) and Jewish Heritage Travel, 4th edition (2007) will keynote the conference. I will be speaking on “Jewish Heritage in Lviv in the Context of International Experience.” I'm using the months leading up to the conference to reacquaint myself with the most pressing Jewish heritage issues in Lviv (former Jewish cemetery, now the Krakowski Market; the TaZ synagogue and adjacent areas; Judaica collections in musuems and aechives; the Tzori-Gilad Synagogue; and the Janowska Road Concetration/Death Camp). Most important is to look to see how to knit these sites together to create a meaningful hertiage landscape for local people and visitors alike. Changing hearts, minds and pocketbooks in Ukraine is not easy - but there have been enough small successes to make us hope for bigger changes in the future. Other anticipated speakers at the conference include Eleonora Bergman (Warsaw), Barbara Kirshenblatt-Gimblett (New York University), Sabine Offe, Felicitas Heimann-Jelinek (Vienna Jewish Museum), Cilly Kugelmann (Berlin Jewish Museum), Vasyl Rasevych, Shelley Salamensky, Michał Szulc, Sofiya Grachova, Sergey Kravtsov, Rudolf Klein, Thomas Hubka, and Bob Martens. Last Week in NYC of Warhol’s Jews: Ten Portraits Reconsidered at Jewish Museum (New York), with catalogue by Richard Mayer with contributions by Gabriel de Guzman (New Haven: Yale University Press, 2008). The retrospective exhibition “Warhol’s Jews: Ten Portraits Reconsidered” will close at the Jewish Museum in New York on August 3, 2008. At this exhibition of these 1980 prints and paintings, Jewish history meets Pop history, providing a good lens through which to view secular Jews’ views of themselves in late 20th century America. Though these portraits of famous 20th Warhol was attracted to faces (he preferred Golda Meir and Martin Buber to Louis Brandeis), and he treated the Jewish luminaries to the same technique he used for society arrivistes and rock stars. But this project was conceived, researched, organized and presented by Jews who embraced it and appreciated Warhol’s no-nonsense non-discriminatory portraiture. Looking back, it represents a moment when American Jews – now part of the post-1960s ethnic-pride movement, were willing to publicly celebrate famous Jews for their Jewishness, not just their achievements. For the previous 150 years American Jews have been hearing the mantra “we must be judged as contributing Americans – not just as Jews.” Suddenly Jews were felt secure enough to publicly play the game of “Who’s a Jew?” with a positive spin. Not since the early days of Zionism, when European artists such as Alfred Nossig created popular works of Jewish heroes (but those figures were biblical, not contemporary) had art and public relations merged so effectively on behalf of Jews. Warhol’s famous Jews express a moment of Jewish pride. Whether critics declare them more kitsch than art or vice versa, no one can see them either ironic or “Too Jewish.” century Jews were, like all of Warhol’s AD-ventures of this period, a commercial enterprise, Warhol was no Philip Johnson, - accommodating Jews as a career move. Warhol and the (Jewish) art dealer Ronald Feldman seemed to have entered into this venture in the mutual spirit of naiveté, discovery and fun. The show will on view at the Contemporary Jewish Museum in San Francisco from October 12, 2008 through January 25, 2009. The well-illustrated catalogue provides a straight-forward background essay on the history of the original project and on how these images have been subsequently perceived. Embracing the project as an opportunity for Jewish education, perhaps on the assumption that more people are familiar with Warhol than with Martin Buber or Sarah Bernhardt (who was baptized a Catholic), the catalogue also provides biographies of all the Jews depicted. To Sergey’s remarks I would like to add that the emergency documentation of the Dushanbe.If you would like to contribution to assist with this work, please contact me. To send contributions directly to CJA contact Sergey at: kravtsov@mscc.huji.ac.il. During recent construction work in Radom, approximately one hundred matzevot. (gravestones) were discovered. Most of these are richly painted. It is not surprising to find Jewish gravestones in this way – since so many were removed during the Second World War and used for paving and other construction work (see recent report on Kremenets, Ukraine). But never before has such a large number of painted stones been found - where the color is so vividly preserved. 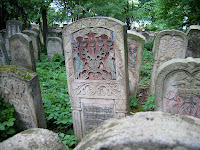 The Foundation for the Preservation of Jewish Heritage in Poland moved to protect the historic gravestones. In cooperation with the local branch of the Monument Conservation Office and the construction workers, the Foundation assures that the matzevot will be properly documented and conserved at the Jewish cemetery in Radom. Increasingly, more and more Jewish cemeteries are being cleared and explored; more painted gravestones are being discovered. Until now, however, these have been few in number and usually isolated. Even when colors are preserved, decades of exposure to the elements has faded their brilliance. The tragic irony is well known among conservators that gravestones that have been hidden, and especially buried, are often the ones where relief carving and painting is best preserved. (ISJM) More than sixty years after one of the largest Jewish cemeteries in Europe was destroyed to make room for a university campus in Thessaloniki (Salonika), Greece; excavation at the Aristotle University for a subway line has spurred new interest in the site’s history, new concerns about the fate of the thousands of Jewish graves, and calls for broader public recognition that the University is built on the site of tens of thousands of Jewish graves. The international community is also showing interest. U.S. Special Envoy for Holocaust issues, Ambassador J. Christian Kennedy, recently visited Greece to discuss the matter, which has been raised by the Greek Jewish community. Excavations for the university library in the 1960s apparently uncovered many graves. Though tunnels for the trains will run deeper than the level of the graves, there are legitimate concerns that excavations for a station and for access and air shafts will violate burials. Witnesses report that the new excavations have already disturbing Jewish graves – though to what extent remains unclear at this time. While no one has suggested that the University be moved or that the cemetery be restored, there is a general sense among protestors that any new excavation must stop, the graves must be respected, and that their should be some sort of commemorative gesture. At the very least, all excavation work done on the site should be done under rabbinic supervision so that graves are protected and remains properly removed for reburial. Such care for graves in uncommon in Greece where it is the custom to excavate and remove ancient burials, and where Christian burial is often only temporary – the bones being then gathered up and removed to ossuaries. In recent years there has been improvement in the Greek response to the legacy of the Holocaust (when I lived in Greece in the 1970s I encountered widespread ignorance and outright denial of thelong and expansive Jewish presence in Greece). In March, Greek president Karolos Papoulias attended the Greek Jewish Martyrs Memory event on the national memory day for Greek Jewish Martyrs and Heroes of the Holocaust. This comes on the heels of Bulgaria's admitting responsibility for the deaths of 11,000 Greek Jews in the Holocaust, probably the major issue that has been pushed in recent years by American-Greek Jewish advocacy groups. While these issues are not specifically related, they speak to a more receptive attitude towards Holocaust history in the Balkans. Bloggers have proposed solutions ranging from naming the new train station after the cemetery, or more constructively, creating a Sephardic Studies program at the University. The cemetery dates back to 1492 when Spain expelled its Jews and thousands found refuge in the small town of Thessaloniki, then under Ottoman rule. As the community grew to be the largest Sephardi center in Europe before the Holocaust – with a Jewish population of over 50,000 - the cemetery became one of Europe's largest, too, with more than 300,000 graves. Thessaloniki, the second largest city in Greece, now has a Jewish population of about 6,000 among its nearly 360,000 residents. The future of the enormous Sephardi cemetery was already in doubt before the Second World War and the German occupation of Thessaloniki. Actions to expropriate the land for the University had already begun in the 1930s, before the Holocaust. This was not uncommon in the interwar period, as many European cities underwent major growth and tried to expand into "open" or "under-utilized" land. Usually Jewish cemeteries were spared because they were much further from the town centers, but not always. In Thessaloniki, it seems that after initial acquiescence, the Jewish community resisted, and that was the state of things when the war started. Then, with the killing of all the Jews, the problem was solved for the surviving populace, since there were few Jews left to protest the taking of the land. there was no discussion of the graveyard during the postwar return of the heirless property of Greek Jewry to the survivors. When the community "sold" its rights to the cemetery, it was stripped of its marble and stone which was recycled by contractors; and "the bones of ancestors were removed to Stavropolis on the other side of the city where the main Jewish graveyard exists today." But Bowman says that only a few hundred families were able to move bones of their relatives to the new cemeteries granted by the city. Since it is estimated that the cemetery had more than 300,000 burials, many bones must remain buried, or scattered amongst the fragments of stones on the university campus and the environs beyond its border. Today one can see many fragments of stones from the cemetery decorating the gardens and entrances of buildings at the University. The situation in Thessaloniki was not an isolated case. Many Greek cemeteries have been built over. In Edirne, for example, a road was cut through the cemetery. Elias Messinas, The Synagogues of Salonika and Veroia. (Athens: Gavrielides Editions, 1997). Construction is complete and sales are underway of the apartments in the new luxury building “On Prospect Park” designed by architect Richard Meier at Grand Army Plaza in Brooklyn, on the site that was once designated for the monumental Union Temple, a project scuttled by the Great Depression. Union Temple was created in 1921 by the merger of two older Brooklyn Reform congregations: Temple Israel and K.K. Beth Elohim. The new congregation decided to build a new home at 17 Eastern Parkway, and commissioned Arnold Brunner Associates for the design. Brunner had designed four important synagogue in Manhattan, and many public buildings. The new design was in two parts. First, there was an eleven-story community house, dedicated on the eve of Sukkot in 1929. The building closely resembles the contemporary luxury apartment buildings of Manhattan’s Park Avenue. Union Temple’s Community House was luxurious, too, with all the amenities demanded of a 1920s Synagogue-Center, including a swimming pool and gymnasium (now used by an independent health club). Work was then to begin on the grand Temple, intended to seat up to 2,000 worshippers. The building design, which is known from only a few presentation drawings, was the last synagogue designed by Brunner, the most prominent and successful American Jewish architect of his generation, who died in February 1925, shortly after the project was announced. Work on the Community House was overseen by William Gehron, who took over most of Brunner’s projects. The design for Union Temple combines two major trends in Brunner’s career; the creation of a classical vocabulary appropriate for American synagogue design, and the creation of monumental pubic buildings to create impressive public spaces in American cities. What a shame that Meier himself has never (to my knowledge) designed a synagogue. He has preferred museums as his form of public architecture. There is still time; he recently designed a church a Rome. More than forty years after the establishment of the Czech Scrolls Memorial Trust in London, congregations holding these Holocaust survivors continue to learn about the scrolls and the history and fate of the communities that owned and used them. These investigations can lead to close ties between Jews and Czech (non-Jewish) communities. Since they were “rescued” in the early 1960s, the Trust has successfully restored and distributed over 1500 Torah scrolls collected in Prague during the Nazi occupation. In recent months, two congregations in the US and the UK have collaborated with a Christian community in Kladno, Czech Republic, to learn more about the history of two scrolls which came from that town, and to commemorate the hundreds of Jews of Kladno who were murdered. Congregation Beth El in Fairfield, Connecticut has one of the memorial scrolls. The Northwood and Pinner Liberal Synagogue (NPLS) in Northwood, Middlesex, UK has a portion of another scroll, as well as scrolls from Kolin and Trebon. Rabbi Andrew Goldstein, who is retiring this year as Rabbi of NPLS, initiated in 1974 the NPLS connection with (then) Czechoslovak Jewry and has led many visits by groups to the Czech and Slovak Republics since the Velvet Revolution. (See: http://www.bjbe.org/spirit/kolin.htm). He and his congregation have been active in efforts to restore Jewish sites in Kolin and elsewhere. However, as described in a recent article by NPLS member Michel Heppner, the Kladno Scroll at NPLS never quite got its due, and connections with that town were not made by congregation. This year, however, Dr. Ellin Yassky (known perhaps to my readers for the beautiful Jewish art books she has edited for publisher Hugh Lauter Levin), a member of Congregation Beth El in Fairfild, Connecticut (USA), took the leadership role in researching her congregation’s Kladno Scroll. Fairfield and Middlesex congregations are working together, and they have linked with the Hussite congregation in Kladno, which owns and uses the former synagogue as its church. Together the three congregations have pieced together something of the history of the scrolls – and more importantly have begun joint commemorative and education programs about the Kladno Jewish community, its history and its fate. A commemorative service was held at the Hussite Church in Kladno last Christmas, when members of the Fairfield Congregation visited on their way to Israel. Last month, on June 6th, the Fairfield scroll was re-dedicated in a ceremony attended by Czech diplomats, American elected officials, the mayor and archivist of Kladno, and the secretary of the Kladno Hussite Church. The guest speaker was Ela Weissberger, a Terezin survivor and a Holocaust education advocate. The Fairfield County Children's Chorale sang songs by Czech composer and Holocaust survivor Franticek Domazlicky. Many of you may know that I have been researching the life and work of American Jewish architect Arnold W. Brunner, in this 150th year since his birth. So it is natural that I might tend towards over emphasizing Brunner's importance, presence and influence. Indeed, I have recently identified a few unattributed synagogue buildings outside of New York as likely works by Brunner, or at least high-quality knock-offs. Still, I wasn't thinking Brunner when I took time off to relax and watch the very good (but very violent) Ridley Scott film American Gangster with Denzel Washington and Russell Crowe. But sure enough, as the film reaches its climactic end, there was Brunner! With the cops closing in, Denzel Washington (as drug dealer Frank Lucas) takes his family to church, and as soon as he opened the door - without even revealing much - I knew he was in Mt. Olivet Baptist Church at 120th & Lenox Ave. (now also Malcolm x Boulevard) in Harlem, formerly Temple Israel, Brunner's most monumental (completed) synagogue, dedicated in 1907. Most of the camera work is on Denzel Washington, so one only glimpses the impressive east wall of the sanctuary. There one sees the classical aedicule of the original Ark still intact, now (and probably since 1920) with a cross suspended above it. This continues this weeks theme of synagogues into churches - and expands it it include churches into Hollywood sets. Today the interior is richly painted, so Brunner’s serene classicism (still visible in Syracuse’ Temple Society of Concord - see earlier blog) – is less easy to see. But all the original architectural details, and the stained glass windows, are there. The opening of the synagogue coincided with the beginning of the transition of Harlem to New York's (and America's) Africa-American cultural capital. Temple Israel sold the building in 1920 and moved to the Upper West Side (to another classical-style synagogue, this one designed by Willian Tachau and now Young Israel of the Upper West Side). The building as church witnessed the Harlem (Black) Renaissance and the subsequent vicissitudes of the neighborhood - now once again on the up-and-up. I attach some recent pictures of Mt. Olivet Baptist Church which show it better. It is well maintained, and a much loved Harlem landmark - at least unofficially. I think it is not listed on the National Register of Historic Places, nor is it a New York City Landmark. This isn’t the first Brunner building to make it to the movies. The 1981 film version of E.L, Doctorow’s Ragtime (directed by Milos Forman) featured the former Renaissance Revival style Free Public Baths on East 11th Street near Tompkins Square, built in 1904-05. That structure was designated a New York City Landmark earlier this year. Throughout the United States there are hundreds of former synagogues that are now churches. No one knows how many...I keep my own lists but they are woefully incomplete. In each city one can usually find an historian, preservationist or journalist who has a pretty good idea and in the right circumstances can help set up a tour, or at least provide a list of addresses. But in New York City, and particularly in Brooklyn, this is hard work. Until this year nobody had reliable lists of even the extant synagogues, let alone the former ones, and no one that I know of had visited many of these buildings in recent years. In 2007, the New York Landmarks Conservancy began a systematic survey of "historic" synagogues in New York - ones that might be eligible for preservation grants. This is part of a larger multi-year effort to survey all the religious buildings in New York City, something that has been talked about for years but only now with the Conservancy's work does it seem to be seriously underway. For synagogues, already the Conservancy team has visited scores of synagogues in Brooklyn and a much smaller number in Queens. I had the privilege to tag along as an "advisor" a bit last summer, and even in those short visits I was impressed by the quality of previously “undocumented” synagogues, and the richness of their decoration - and particularly the stained glass. Even the Conservancy survey has not yet visited all the many former synagogues that are now churches - usually serving small independent Protestant congregations - especially Baptist - and increasing Pentecostal and other charismatic sects, as well as Jehovah's Witness congregations. And these buildings are often the ones that need the most care, because they are run independently, often without regular membership and funding, and because they were often bought by their new congregations when they were old and cheap, and maintenance and expensive repairs have often been deferred for years. In thinking about the problems of these congregations, and the often seemingly irresolvable state of repair of their (often once-impressive) buildings, I re-read the excellent New York Times story by David Gonzalez that ran this past January 28th (2008). Gonzalez and photographer Ruth Fremson take the reader into two of these congregations - the well-maintained Linden Church of Seventh-day Adventists in Queens (formerly Laurelton Jewish Center) and the large and dilapidated St Timothy Holy Church in Brownsville, Brooklyn (formerly the Amboy Street Shul), and present their difficult situations in a broader context. Since - when the New York Times is concerned - I'm still a print guy, I did not notice that the author and photographer had posted an audio-visual presentation on-line that presents even more - especially visually - of the story. Ms. Fremson's photos are especially noteworthy and should be more widely seen. Below is a link to the story. Click the modest link to the audio-visual presentation under the second photo. Watch the slides at full screen for best effect. My compliments to Mr. Gonzalez and to Ms. Fremson. We need more main-stream media stories about the plight of our religious buildings. Whether we are religious or not, we must recognize that these buildings carry much of our history and art, and importantly stand as architectural landmarks - centers of gravity, if you will - in countless urban neighborhoods across America. We must first document these buildings, and then where possible, assist to protect them a preserve them for present and future use. USA: National Trust for Historic Preservation Names New York's Lower East Side to 2008 list of America's 11 Most Endangered Historic Places. National Trust for Historic Preservation Names New York's Lower East Side to 2008 list of America's 11 Most Endangered Historic Places. (ISJM) The National Trust for Historic Preservation, America's foremost historic preservation organization, announced on May 20th its list of eleven most endangered sites in the United States. As in many recent years, the Trust has chosen not to emphasize specific buildings, but has sounded the alarm about the real or potential destruction of entire historic neighborhoods, cityscapes and landscapes. On this year's list is New York City's Lower East Side, the historic home to multiple waves of immigrant populations, including hundreds of thousands of East European Jews who settled in the area (mixing or displacing earlier immigrant groups) especially between the 1880s until the First World War. The area has remained, or has been re-invented, in the popular American Jewish imagination as the historic heartland of American (read: East European) Jews. After the destruction of so much of the Jewish culture of Europe in the Holocaust, the Lower East Side (or East Side as it was earlier known) took on greater significance for American Jews – many of whom were now embracing suburban life - as a potent reminder of "from where they came." The area is usually recalled with mixture of fact and myth (see Hasia Diner's excellent book "Lower East Side Memories"). Publication & Exhibition: Gilded Lions and Jeweled Horses, The Synagogue to the Carousel: Jewish Carving Traditions at Fenimore Art Museum through September 1, 2008. (ISJM) In my work I see a lot of exhibitions about Jewish art and history. Some are good, some bad, and some ugly. Every so often there is a great exhibit, and Gilded Lions and Jeweled Horses is such an occasion (I went to see it three times when it was at the American Folk Art Museum in New York City earlier this year). If you have not seen it, there is still a chance this summer at the excellent Fenimore Art Museum in beautiful Cooperstown, in Upstate New York (also home to the Farm Museum and the Baseball Hall of Fame). Gilded Lions and Jeweled Horses is a small exhibit, but meticulous. And every carving and papercut deserves attention. The premise seems slight and even amusing – that Eastern European carvers of Ark ornaments came to Brooklyn and made carousel horses. But this realization sent the curator, artist Murray Zimilas on a decade long search that has brought together evocative, exciting and beautiful Jewish folk art to make his point. Nowhere before has there been assembled such a menagerie of Jewish lions and other animals. These carvings – all of which are vividly painted – breath life into the old images of European and immigrant shuls. These were not somber and dour places in black and white, but could be vibrant and joyous in their architecture and decoration, opening up fantastic worlds of imagination to hungry hearts, souls and minds. Not only did immigrant Jews turn to carousel carving, but they turned to all manner of visual arts when the opportunity arose. Almost all of the exhibited pieces can be seen in excellent color photographs in the fine accompanying volume published by Brandeis University Press. This book, which has already won awards, should become a standard in any library of Jewish and/or folk art. There is a broad-ranging introductory essay by Vivian Mann that blends scholarship and accessibility and puts the Gilded Lions and their progeny in an art historical context useful to experts and laypeople alike. The website of the Foundation for the Preservation of Jewish Heritage in Poland is one of the most important new engines for tracking the location and condition of Jewish heritage sties. I’ve been involved off and on with the documentation and preservation of Jewish sites in Poland for almost 20 years, waiting for this kind of a high-quality, well-designed and easily accessible database on sites with extensive photographic and descriptive information (I was involved with a failed effort to do this in an earlier computer age). While there is still a long way to go, already over 5000 photos of about 300 sites (mostly cemeteries) are posted. This site does not replace the often more detailed information one can find (erratically) through Shtetlinks and the IAJGS’s cemetery project (http://www.jewishgen.org/Cemetery/ ) and other on-line sources, but it presents the most up-to-date information available on-line. The Foundation was established by the Union of Jewish Communities in Poland and the World Jewish Restitution Organization (WJRO) with the aim of reclaiming properties owned by Jewish Religious Communities and other Jewish legal entities before World War II (based on the Law on the Relationship between the State and the Union of Jewish Religious Communities of 1997), and the management, restoration and protection of returned properties, especially those of religious or historical significance. After a slow start, the work of the Foundation is well underway and generally of very high quality. To date the Foundation has been involved in restoration projects at many cemeteries including completed projects at Kolno, Koszalin, Kozienice, Różan, Strzegowo, and Zakopane. projects in Bodzanów, Dubienka, Frampol, Iłża, Iwaniska, Kłodzko, Mszczonów, Narol, Przasnysz, Sochaczew, Zielona Góra, Ziębice and elsewhere. The Foundation is also sponsoring the restoration of the 17th-century synagogue of Zamosc, and has organized extensive educational programs in Poland. On the web, the Foudnation sponsors the portal POLIN – Polish Jewish Heritage! Which include information including histories, photos, maps and other materials for scores of Polish Jewish sites. The database of information keeps expanding and POLIN welcomes contributions from viewers. (ISJM) On July 10, 2008, at a ceremony in Slupsk (Poland) a memorial tablet was unveiled to commemorate the deportation of the Jews from Slupsk (formerly Stolp) in Pomerania, now northwest Poland, to Auschwitz. The Plaque was installed at Deotymy 15a St. which today houses a Middle School, but was a Nazi transit camp for Jews during the war. German-Jewish Architect Alfred Jacoby has built his first synagogue in the United States, an elegant structure in the ski-resort town of Park City, Utah, home of the U.S. Ski team and the Sundance Film Festival. Temple Har Shalom was dedicated on June 27, 2008. Jacoby is the most prominent post-war synagogue architect in Germany. He achieved notice in America in 2002 at the time of a traveling exhibition of his work, which included a stop at the University of Utah. In the past two decades has designed synagogues in Darmstadt (1988), Heidelberg (1994), Aachen (1996), Offenbach (1998), Kassel (2000), and Chemnitz (2002). Jacoby, a professor and director at the Dessau Institute of Architecture, has a reputation as a synagogue designer in Germany today similar to Percival Goodman’s in America in the 1950s to 1970s – he’s the go-to guy for new community-based synagogues (as opposed to the more politically-motivated monumental “show” synagogues, like those in Dresden and Munich. Jacoby’s designs are always interesting and sometimes innovative, but they are also always easy to understand and mostly comfortable to use. He is known as a synagogue architect with whom communities can work. Jacoby’s buildings are known for their use of contemporary architectural forms and materials, but unlike Goodman, until now his designs are in adherence to traditional Orthodox spatial and liturgical requirements. But though Jacoby creates synagogues that are nominally Orthodox, most congregants are Russian-Jewish immigrants not well trained in traditional Judaism, let alone the rudiments of Orthodox worship. His buildings, therefore, support a comfortable Orthodoxy that emphasizes community building as much as punctilious prayer. While Temple Har Shalom is his first design for a Reform congregation, his aesthetic is easily adapted in this new situation. Temple Har Shalom invited a large number of distinguished and up-and-coming architects to submit RFP’s for the synagogue project, and after review chose Jacoby over several more unconventional architects. Jacoby’s designs in general, and at Park City, tend to be accessible, elegant and non-confrontational. They combine some of the best (and most tranquil) qualities of rationalism and simple geometry (Jacoby studied with Aldo Rossi in Zurich in the 1970s), with an expressive use of light that derives in large part from American modern synagogues designed by Eric Mendelsohn and Percival Goodman during the post-War period. Jacoby likes to mix up materials, and is especially fond of dark wood veneers, white walls and occasionally limestone accents. At Temple Har Shalom, as in Jacoby’s recent work in Kassel and Chemnitz, there is an abundance of wood, recalling perhaps, some of the work of Alvar Aalto and synagogues of Pietro Belluschi. The complex also has a vestibule/common room with a fireplace set in a brick wall, perhaps a nod to a ski lodge aesthetic. In many of his previous synagogues Jacoby has shown a penchant for circular or elliptical forms (Aachen, Heidelberg, Chemnitz), something he avoids at Park City, where the sanctuary has a more traditional rectangular plan, and can be expanded. Until now, Jacoby's best previous designs have mostly been for city synagogues – where they often help to heal the urban form, carefully weaving the new architectural forms, spaces and processionals into older urban fabric. At Park City he works to integrate the building to the striking landscape. Following popular trends in American synagogue design (which go back to the 1960s), Jacoby opens up the building to the landscape with large floor-to-ceiling windows that reveal big vistas from two floors. The sanctuary, however, remains a more sheltered space, its large east wall windows filled with stained glass designed by Jun Kaneko of Omaha, Nebraska. Overhead, a wood ceiling, something like a stretched out sine wave, undulates upward to its high point above the Ark (this is almost the reverse arrangement used by Mendelsohn at B’nai Amoona in St. Louis). Jacoby likens the ceiling profile to that of the nearby mountains. More than any element it energizes the space. Not everything about Temple Har Shalom is new. The congregation owns a Torah scroll, now restored and made kosher, that was once in Zamosc, Poland, and managed to survive the Holocaust. Coincidentally, the 17th-century synagogue in Zamosc also survived, and after years of use as a library, is now receiving the restoration it deserves (more on that important building and project another time)..
On Alfred Jacoby see: In Einem Neuen Geiste / In a New Spirit: The Synagogues of Alfred Jacoby (Frankfurt am Main: Deutsches Architektur Museum – Aktuelle Galarie, 2002). abandoned. Now its roof is in terrible condition, and according to Kravtsov, it is not likely to survive a heavy snowfall. Still, it has managed to survive this far, and the walls appear to be fairly strong. The documentation at Subate is part of a survey of the synagogues of Latvia begun last fall by the Center in partnership with the Mr. Meijer Melers and the Jewish Museum of Riga. According to Melers and Kravtsov, Latvia once had 280 synagogues (Old photos and information about many of these are illustrated in the large volume, Latvia Synagogues and Rabbis 1918-1940, edited by Rabbi Menachim Barkin and published by the Jewish Community of Latvia in 2005). Today, 43 synagogue buildings are known to exist. Most are masonry buildings, the rest are made of wood. In discussing the situation at Subate with ISJM, Kravtsov and Melers both addressed the financial and logistical difficulties involved in saving the synagogue; it in unlikely to gain support given its out-of-the-way location and lack of local sponsor. However, there is the tradition and possibility the building could be moved to an outdoor architectural museum (scansan) where it would be protected and widely viewed. This is a solution that has been carried out for several 19th century wood-frame synagogues in the United States. Other synagogues from around the world have been moved, at least in part, and re-assembled with varying degrees of success in Israel. For now, funds are needed to carry out “first-aid” in situ repairs to rotten sections, and to evaluate the overall building condition to see if moving and re-erection is even possible. One challenge to including the synagogue at the scansan would be the need to reconstruct to some degree the interior arrangement – all of which is now lost. See Sergey Kravtsov, “Survey of Synagogues in Latvia,” in bet-tfila.org/info Nr. 6 on-line at http://www.bet-tfila.org/data/info-pr-0207.pdf., pp. 6-7. (ISJM) Reuters News Services has reported the demolition of the only synagogue in Tajikistan - a small one-story wood building in the capital city of Dushanbe. The building was probably erected in the late 19th or early 20th century. Demolition of the Jewish complex was first announced in 2004, and commenced in February 2006 when a mikveh and classroom building adjacent to the synagogue were razed. The removal of the buildings makes room for a new presidential palace for President Imomali Rakhmon, who has ruled since 1992, and an adjacent park. The Jewish community had previously proposed that the synagogue be renovated and incorporated into the new urban arrangement, but this proposal was rejected. Instead, the Community, which only numbers a few hundred individuals, has been offered land in a more remote area of the city with permission to build a new synagogue, but it is far from certain that the small, aged and under funded community will be able to do so. Most Tajiki Jews – especially young people - emigrated to Israel after 1990. The building belonged to the state because Soviet officials nationalized it in 1951 while allowing Jews to continue to worship there. Tajikistan did not restitute the property as has been done on some occasions in other former Soviet Republics. The destruction of the synagogue should not be seen as a specifically anti-Semitic act. Rather, it is a sign that the Jews in Tajikistan are marginalized and of little account. In such circumstances, an authoritarian government can make plans as it chooses. (ISJM) It is period of uncertainty for the future of the Jewish quarter of L'viv, Ukraine, as properties in and around the historic district become available for new development, including lots adjacent to the site of the 16th century Golden Rose Synagogue. So, last week in L'viv, protagonists involved in the planning and development of the future of the city's historic Jewish neighborhood (part of the larger historic center which is a UNESCO designated World Heritage Site) gathered together for a "roundtable" discussion sponsored by .The Center for Urban History of East Central Europe (see: http://www.lvivcenter.org/). Part of the regular Kolo Lvova series, last month's topic was "Around Staroevreiska Street: At the Heart of Lviv's Jewish Heritage," and drew about 20 people, most of whom are in some way stakeholders in the future of the area. This discussion was seen as an important step forward for a area with a contested history, and where there has been a lack of clear process in planning efforts. Later this fall (October 29-31) The Center for Urban History will also host an exhibition about historic Jewish L'viv (also known as Polish Lvov and Austrian Lemberg) and an international conference "Urban Jewish Heritage and History in East Central Europe." Participants in last week's discussion included a representative of the city administration; Jewish activist Meylakh Shekhet, who heads the "Yevreiske Vidrodzhennia" (Jewish Revival & Rekindling the Jewish Flame), a Jewish cultural organization housed in premises adjacent to the historic Golden Rose (or TaZ) Synagogue; and Yuri Lukomski, the local archaeologist now at work excavating lots in the area. There were also several writers, artists, and museum experts present. district will convince the developer to cooperate with local historians, archaeologists and preservationists to create a project appropriate for the location. The Center for Urban History provides a "neutral" space in L'viv where complex and often conflicting attitudes towards the city and its history can be explored. While there was no specific goal for the discussion, and no specific results came of it, the organizers and participants believe it is an important stage in developing a consistent and open process. . Tarik Amar, Academic Director of the Center, reports that there are plans to form a group of those interested in Jewish heritage to continue these discussions. I will be reporting more about Jewish L'viv in upcoming posts. (ISJM) This year’s European Day of Jewish Culture has been set for September 7, 2008. The day is a celebration of Jewish heritage sites and culture across Europe and is now observed in 30 countries. Developed following a program in Alsace that arranged for dozens of usually inaccessible synagogues, former synagogues and cemeteries to be open to the public, the Day of Jewish Culture now includes almost every conceivable type of cultural event including lectures, concerts, tours, and seminars. But access to Jewish sties for a wide (and mostly local public) and instruction about them remains at the heart of the celebration. This year, the theme is “Testimonies”, chosen to highlight the cultural “imprint” left by the Jews wherever they have lived in Europe. 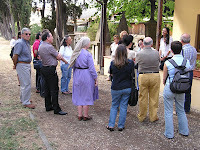 Thus, the Cultural Day unites those places which retain active Jewish communities and those Jewish spaces without Jews. Participating countries include Austria, Belgium, Bosnia-Herzegovina, Bulgaria, Croatia, Czech Republic, Denmark, France, Germany, Greece, Holland, Hungary, Italy, Lithuania, Luxembourg, Macedonia, Norway, Poland, Portugal, Romania, Russia, Serbia, Slovakia, Slovenia, Spain, Sweden, Switzerland, Turkey, Ukraine and United Kingdom. In past years throughout Europe as many as 1,000 volunteers joined to organize and coordinate events. Each country arranges its day differently. For some, it is the only time that certain places are open. Elsewhere, the Day is used to draw attention to otherwise little-known sites that are now accessible year-round. Since 2004, the event has being co-organized by B’nai B’rith Europe, the European Council of Jewish Communities and Red de Juderías de España. 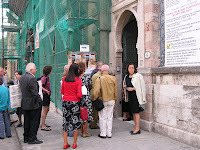 For more information: www.jewisheritage.org; details of the events online from June 2007 onwards. The on-gain, off-again restoration of the White Stork Synagogue in Wrocław, Poland (formely Breslau, Germany) is nearing completion. The historic is the center of the local Jewish community. It was returned to the Jewish community in the 1990s, and was on the first Jewish heritage projects in Poland to receive substantial funding from Germany. But after initial building stabilization work and interior restoration, the project slowed. Now, ISJM member Ruth Ellen Gruber reports that work is continuing at a faster pace thanks in part to efforts of the Norwegian Jewish singer Bente Kahan and the Bente Kahan Foundation, established in 2006. Restoration of the impressive synagogue and the Aron ha-Kodesh (ark) are almost complete. The synagogue has a main prayer hall surrounded on three sides by galleries for women. There are two levels of galleries to the north and south and a single gallery on the east (ark) wall. The wood frame of the Aron ha-kodesh and the damaged tablets of the Ten Commandments are all that remain of the original religious features. The synagogue remained in use until 1974 when the authorities expropriated it from the community and gave it to the University of Wrocław for use as a library. In 1989, the University then transferred the building to the Musical Academy, from which a private firm purchased it in 1995. It was returned to the Jewish community and has undergone intermittent restoration for the past decade. In addition to raising funds and coordinating restoration efforts, the Foundation sponsors weekly concerts in the synagogue during the summer. 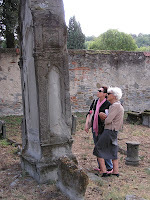 Bente Kahan told Ruth Gruber that enough funds have been raised to complete the restoration by 2010. According to Gruber” she's managed to do this by making her foundation a "neutral, non-profit organization" that, because of its neutrality, can navigate the sometimes treacherous waters between the municipality and the Jewish community. The small synagogue, marked by it two-towered façade, was designed by local architect George Edward King and dedicated in 1884 when Leadville was Colorado's second largest city. Leadville's Jews included the Guggenheim family and David May, founder the May Department Stores. The synagogue was an elegant structure outfitted with crystal chandeliers, stained-glass windows and a finely designed ark. The congregation struggled through the decline of the town's mining industry which began in the 1890, and finally was forced to close in 1930. After the building was sold in 1937, it was used briefly as a single-family residence and as a church vicarage, and finally as an apartment house. “Restoration,” has really meant a top to bottom rebuilding of almost all elements, especially after an electrical fire in 2006 gutted the rear part of the structure. Long Hoeft Architects of Georgetown, Colorado have tried to replicate as closely as possible the originally forms of the building using a mix of the same materials, and new materials required to meet modern safety requirements and which can accommodate the installation of modern electric and other mechanical systems. The Temple Israel Foundation was incorporated in April, 1987, "to acquire, historically rehabilitate, and maintain" the Temple Israel building and to research the history of the Jewish community in Leadville. In October, 1992, the Foundation purchased the Temple Israel building. Beginning in 1994 with the receipt of a matching grant from the Colorado State Historical Fund, the Temple Israel Foundation pursued the authentic restoration of the Temple Israel building. This first grant funded preliminary drawings and an assessment by Long Hoeft Architects of Georgetown, Colorado. A second matching grant was given in January 2001 and significant funding was also contributed by Miriam K. Rothenberg and the May Department Stores. Work on the restoration of the façade was completed in October, 2001. The Foundation received a third grant from the Colorado State Historical Fund in February, 2007, and for the reconstruction of the synagogue itself. After more than a year of work, the interior structure and wall decoration should be completed this summer. According to Bill Korn, President of the Temple Israel Foundation, the former Temple will be open for limited use as a museum (of the Jewish experience in the industrializing West) this fall. It will also be available for use as a synagogue, when needed.